Home Health Care Products Milton | Products & Services | Adjust to Home Health Care Supplies Ltd.
From wheelchairs and stair lifts to daily living aids, we offer a wide range of home health care products. Our experienced professionals offer home health care products and services in Milton and surrounding areas. We are committed to finding long-lasting solutions and will help you achieve a better quality of life. We strive hard to remain innovative and progressive to address all your health challenges. ADP offers government-funded assistance on mobility items. Call us about how you can receive assistance on mobility items. If you are a veteran and have K #, talk to us about how you can receive assistance on home health care items. We are a WSIB-authorized vendor. To qualify for assistance, please provide us with details including: case #, date of the accident, new prescription, and case worker name and phone number. We will then obtain authorization to get the product you require to you as quickly as we can. At Adjust to Home Health Care Supplies Ltd., we offer top-quality brands in medical, mobility and daily living products. For greater convenience, choose from the list below and navigate directly to the corresponding area of the page. Whether you have a light sprain or are on the road to recovery from surgery, Adjust to Home Health Care Supplies Ltd., provides a wide array of braces and splints from head to toe. Whether you have a prescription or not, the fitters have been trained to zero in on the brace that best suits your injury or your needs. No appointments necessary. Our brands include Airway and DJO-Aircast. Adjust to Home Health Care Supplies Ltd., offers a wide range of insoles and foot products in brands such as Spenco® PolySorb™. If you’re on the road to recovery from an injury or a surgery, we offer a range of rehab therapy supplies that can turn your injury into a thing of the past. We carry such products as therapy putty and a full array of TheraBand™ products to suit all your needs. Other brands include Thermophore and Theratherm™. It can seem like one of the most daunting of tasks to ensure that your loved ones can have both privacy and safety in the bathroom. From safety grab bars, shower mats, transfer benches and bath chairs to raised toilet seats, at Adjust to Home Health Care Supplies Ltd., we cover all angles. No safety issue in the bathroom has been unanswered. Come in and see our wide range of bathroom safety products in brands like Drive Medical. If you or a loved one has trouble getting into and out of the bathtub safely, we offer bathtub lifts that are easy to use and secure. Don’t risk a fall in the bathtub! Incontinence is always a challenging topic of discussion as it can be a very private matter. Working out solutions may not always be as easy as it seems. At Adjust to Home Health Care Supplies Ltd., we have some solutions to the incontinence issues in your family. We are proud suppliers of Tranquility products. Not sure what type of incontinence product is best for you or your family member? Try our sample program in which you can try a few types of products before committing to a particular type. When you’re ready to choose, we offer incontinence products by the case to keep your costs down. At Adjust to Home Health Care Supplies Ltd., we realize that incontinence can make personal hygiene a challenge. Don’t sacrifice personal cleanliness! We offer products such as male and female urinals, invalid rings and an assortment of bed pans and sitz baths. Tired, aching feet? Compression therapy can benefit everyone, young or old. We offer a range of choices and options to suit your specific needs. Our experts at Adjust to Home Health Care Supplies Ltd., are certified fitters and can provide you with one-on-one service. As always, no appointment is necessary. Brands include BSN, Jobst®, TruForm and Sigvaris. Our motto at Adjust to Home Health Care Supplies Ltd., is “Making Daily Living Simpler,” so we can help if you have struggles throughout the day with the simplest of tasks. We can get you back to daily living! We offer a wide array of reachers, grab bars, sock aids, long-handled shoe horns and other items to boost your independence. If we do not have the product in stock for you, we’ll research and order it for you. We have access to more than 200 suppliers, so you can be assured that we’ll find it! Brands include Drive Medical and Parsons. We carry lift chairs from top brands such as Eclipse™ Medical Inc., Nexidea and Golden Technologies. Having the right bandage can make the wound heal faster and safer. How do you know what bandage is right for your wound? Our professionals have been trained on wound management and can assist you in getting the best wound care for your situation. 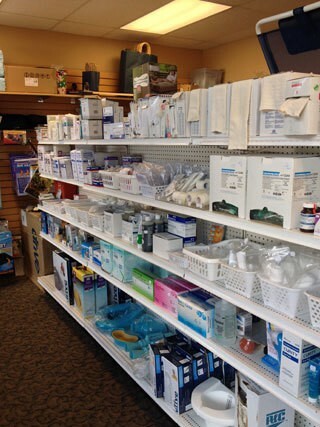 We offer a wide array of bandages and supplies and options for you. Visit us today and ask for assistance. Brands we carry include Mepore®, 3M and Smith & Nephew Jelonet. At Adjust to Home Health Care Supplies Ltd., we also offer quality surgical instruments and other related supplies such as intravenous (IV) poles and overbed tables. 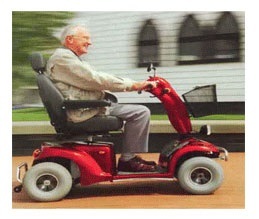 Adjust to Home Health Care Supplies Ltd., is always happy to assist you with all your mobility needs. We are authorized by the Assistive Devices (ADP) Program, the Workman’s Compensation Insurance Board (WCIB) and Blue Cross (Veterans’ Affairs). We offer both rentals and sales and carry such items as: scooters, wheelchairs, transport chairs, rollator walkers, two-wheeled walkers, canes, crutches and accessories for each. Brands include Drive Medical and Eclipse Medical™. At Adjust to Home Health Care Supplies Ltd., we carry transport wheelchairs in brands like Drive Medical. Find both 3- and 4-wheeled scooters for those with mobility issues at Adjust to Home Health Care Supplies Ltd.
No need to live on just one level of your home. We offer help up the stairs with safe, durable Acorn and Direct Alert stair lifts. Are you new to ostomy care or looking for a new supplier? We have access to a range of ostomy supplies and products for all your ostomy needs. We carry many brands, including Hollister and Coloplast. Once you become an ostomy customer, we will carry a supply of your product so that in the event of an emergency, there is no need for you to wait. If you’ve any questions about our products and services, call us at Adjust to Home Health Care Supplies Ltd., today.